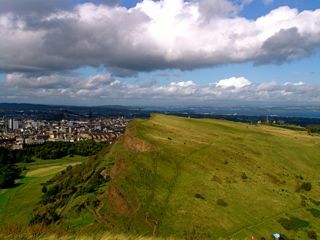 Standing on top of the ‘Arthur’s seat’ in Holyrood park, as if we are close to the sky, the air is pure, the sun is bright. And I can see the shadows of the clouds, I love to see the shadows of the clouds – a scene that can rare be seen in the busy cities. If you are standing at one point, and gradually making a 360 degree turn, the beautiful sea, the city landscape all came to the eyes, one after another. Prawns are my favorite food — I mean real favorite. :)) In Chinese cuisine, prawns can be stir fried, fried, or cooked in the soup. Whichever way of cooking it, keeping the taste fresh is very important. And since the prawns themselves have very light taste, it can easily be masked by the seasonings and the sauce, which makes the ‘supporting ingredients’ and the seasonings very important. 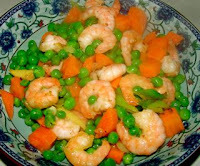 The original northeast recipe for this dish involves stir-frying the prawns with cucumber and carrot. 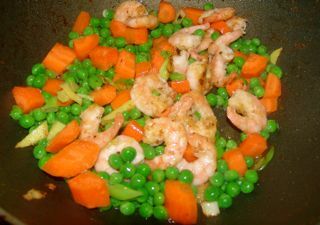 Although I like the way these vegetables separately combine with prawns, I am not sure about the combination of cucumber and carrot, so I replaced the cucumber with green peas. And as for the taste, spring onion, ginger and garlic help bring out the original taste of the prawns. Like many other dishes in Northeastern China, prawns are lightly fried first with egg white and corn flour mix, then stir fried with other ingredients — but very lightly fried, so the freshness and tenderness of the prawns can be kept. Apart from this, the dish is very easily made. 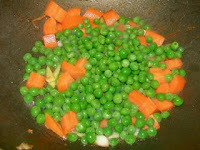 Carrots, egg white, green peas, spring onion, ginger, garlic, cooking wine, salt, corn flour, and oil. 1) Mix one egg white with one tablespoon of corn flour into a thin paste. 2) Mix the prawns into the paste. 3) Chop a small carrot into small pieces. 4) Chop 2 gloves garlic, 1/2 spring onion, and a small piece of ginger into slices. 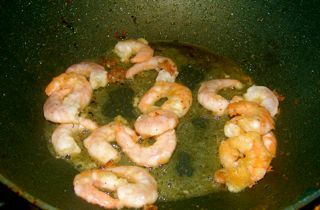 1) In the heated wok, pour in oil (enough for frying prawns). 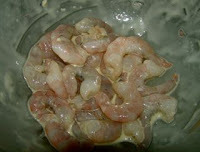 2) When the oil is hot enough, put ‘wrapped’ prawns into the oil. 4) Keep around 2 tablespoons oil in the wok, remove the rest. 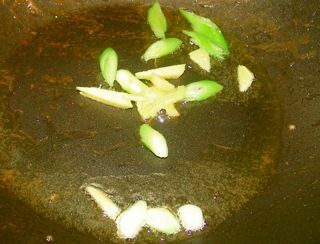 5) Add in chopped spring onion, ginger and garlic, stir fry a little, until the fresh smell of them rising from the wok. 6) Add 1/2 cup of green peas and chopped carrot into the wok, stir fry. 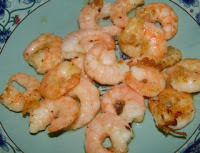 7) Put lightly fried prawns back to the wok, stir fry with the rest of the ingredients. Almost easy, no? It is good to go with rice or Chinese bread. The only thing worth to mention is that in the Chinese ‘healthy food bible’, it is advised that it is not good to have fruits immediately after having prawns, the ‘acid’ in the fruits can damage the nutritious properties in prawns, and might cause stomach irritation. It is better to wait for an hour before having fruits.